Add a touch of sophistication to your Christmas reds by using Merlot Sparkle Mica. Not only does this mica show up brilliantly in melt & pour soap, it holds color exceptionally well in cold process soap. In fact, combining Merlot Mica with Electric Bubblegum results in what many would consider to be ‘true red,’ which is an exceptionally difficult color to achieve in cold process soap. 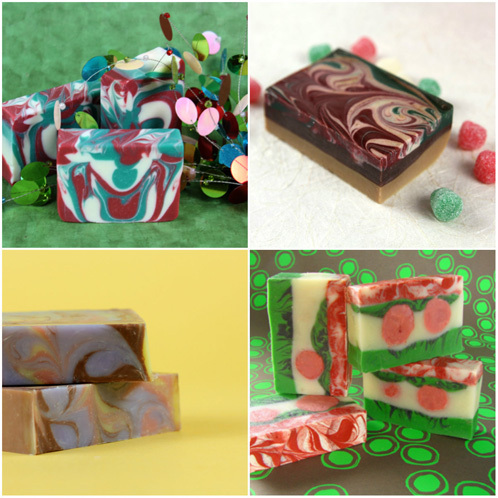 We’ve used Merlot Mica in a number of recipes, including the Cheery Holiday Soap, Holiday Cookie Bar Tutorial, Cold Process: Oven Process Swirls and a Palm-Free In-The-Pot-Swirl. As a general rule of thumb, you can achieve a “perfect” red in cold process soap by combining 1 part Merlot to 2 parts Electric Bubblegum. Keep in mind that this is just a starting point, and you can add more or less of each color to tweak the final result. 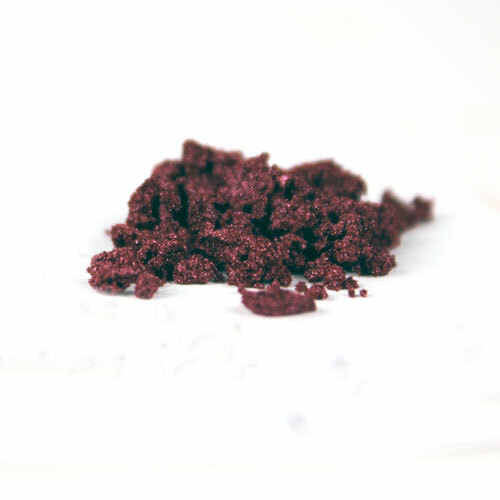 We’re a big fan of Merlot Sparkle Mica in melt and pour soap because it is a non-bleeding color. If you’re not sure what that means, here’s a video and a helpful blog that cover color basics. You can also read about all the the non-bleeding colorants that Bramble Berry carries here. Pair this color with fragrances like Red Apple, Berry Wine or Hollyberry Cybilla for a beautiful rich red to match the sweet scent! Hi! I have some Merlot sparkle mica and have semi-successfully made a red with it but not as pretty as the CPOP or cheery holiday soaps! What I was wondering is: if you had a ratio of powdered (undispersed) Merlot sparkle to electric bubble gum or burgundy oxide per cup of soap to achieve the colors in the pictures? We typically disperse the Electric Bubble Gum in a liquid oil as that helps to disperse it into whatever cold process soap recipe we are working with. If you have any other questions, let us know!